Chobani is a brand of Greek-style yogurt that hit store shelves in 2007. 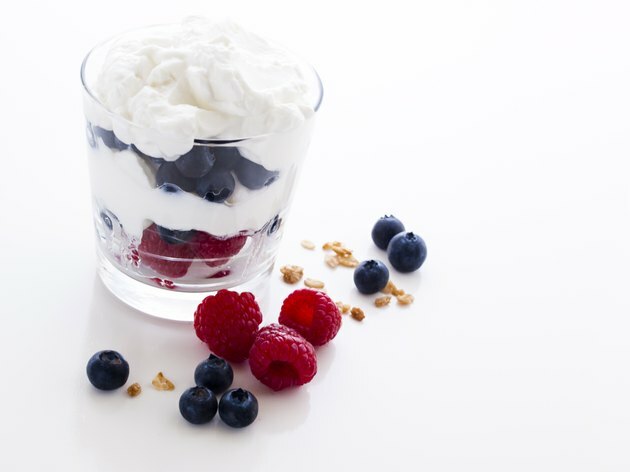 Greek yogurt is strained, which removes most of the whey and creates a thicker, creamier yogurt that is higher in protein and lower in sugar than traditional yogurts. The Chobani brand offers a number of different types of Greek yogurt, from fruit on the bottom to flip-style. Knowing the nutrition information for all the different types of Chobani Greek yogurts can help you decide which type fits your diet. Fruit on the Bottom yogurts from Chobani come in a variety of flavors, including banana, pineapple and apple cinnamon. Additionally, they offer flavors that are fat-free and flavors that contain 2 percent fat. The fat-free Fruit on the Bottom yogurts contain 140 calories, 20 to 22 grams of carbs, 19 to 21 grams of sugar, 14 grams of protein and 65 to 70 milligrams of sodium. They also meet 20 percent of the daily value for calcium per 6-ounce container. The 2-percent-fat Fruit on the Bottom yogurts contain 160 calories, 3 grams of total fat, 2 grams of saturated fat, 19 to 21 grams of carbs, 18 to 20 grams of sugar, 14 grams of protein and 65 to 90 milligrams of sodium. They meet 15 percent of the daily value for calcium in a 6-ounce container. For heart-health, you're better off with the fat-free Chobani yogurts. High intakes of saturated fat raise blood cholesterol levels, and the American Heart Association recommends you limit your intake to less than 7 percent of calories. Like the Fruit on the Bottom yogurt, Chobani Blended yogurts also come in a variety of flavors, as well as flavors that contain no fat and 2 percent fat. A 6-ounce serving of fat-free Blended Chobani yogurt contains 130 calories, 18 to 20 grams of carbs, 16 to 17 grams of sugar, 13 to 14 grams of protein and 80 to 100 milligrams of sodium. This type also meets 20 percent of the daily value for calcium. A 6-ounce serving of the 2-percent-fat Blended yogurts contain 160 to 170 calories, 3 to 4.5 grams of total fat, 1.5 to 3.5 grams of saturated fat, 19 to 21 grams of carbs, 17 to 19 grams of sugar, 13 to 14 grams of protein and 60 milligrams of sodium. This yogurt meets 20 percent of the daily value for calcium. Chobani Bite yogurts have a small serving size, 3.5 ounces, and come in fun flavor combinations, including fig with orange zest and mint with dark chocolate chips. A 3.5-ounce serving of a Chobani Bite contains 100 calories, 1.5 grams of total fat, 1 gram of saturated fat, 12 to 14 grams of carbs, 12 grams of sugar, 8 grams of protein and 40 milligrams of sodium. It meets 10 percent of the daily value for calcium. Chobani Flip yogurts combine various yogurt flavors with crunchy mixes, such as nonfat strawberry yogurt with honey oats and low-fat coconut yogurt with chocolate chips and almonds. The nutrition information for the Flip yogurts varies widely from flavor to flavor, ranging from 150 to 230 calories, 1.5 to 10 grams of total fat, 0 to 4.5 grams of total fat, 21 to 25 grams of carbs, 14 to 22 grams of sugar, 12 grams of protein and 80 to 105 milligrams of sodium. They meet 15 percent of the daily value for calcium. Chobani Champions yogurt are small in size like the Bites and are designed to please the palates of kids. Flavor options include strawberry, blueberry and dragon fruit. Each 3.5-ounce serving contains 100 calories, 1.5 grams of total fat, 1 gram of saturated fat, 13 to 14 grams of carbs, 13 grams of sugar, 8 grams of protein and 40 milligrams of sodium. They meet 10 percent of the daily value for calcium and 20 percent of the daily value for vitamin D. Vitamin D helps you absorb calcium and helps keep your bones healthy and strong. Designed for children, Chobani Tubes come in a variety of fruit flavors, including Swirlin' Strawberry Banana and Rockin' Blueberry. Each 2.25-ounce yogurt tube contains 70 calories, 1 gram of total fat, 0.5 grams of saturated fat, 8 to 9 grams of carbs, 8 grams of sugar, 5 grams of protein and 25 milligrams of sodium. The product meets 6 percent of the daily value for calcium and 15 percent of the daily value for vitamin D.